Using High Sierra? Here’s a handful of things that you probably haven’t spotted. Discovered any more? Share them in the comments below. Remember: We’re only looking for things few people have yet seen. Headline features are easily read about on other blogs around and about. 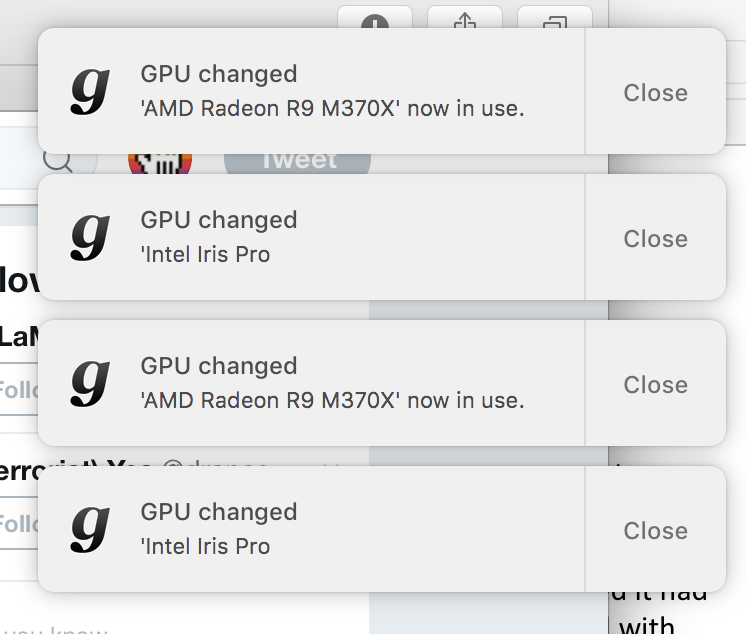 Plug in a power adapter on a MacBook Pro with a GPU, and it’ll automatically activate the GPU. With previous releases of macOS/OS X, the GPU was activated on an as-needs basis, such as when you ran Adobe Photoshop. macOS High Sierra Server edition (around $20 on the App Store) has always been able to cache updates for other devices on the network. In other words, an iOS update would automagically be cached when it became available, and then all iPhones and iPads could grab it without having to download it themselves – saving time and Internet bandwidth. Nothing needed to be done to make this happen – it just worked. Well, in High Sierra, caching comes to all Macs. 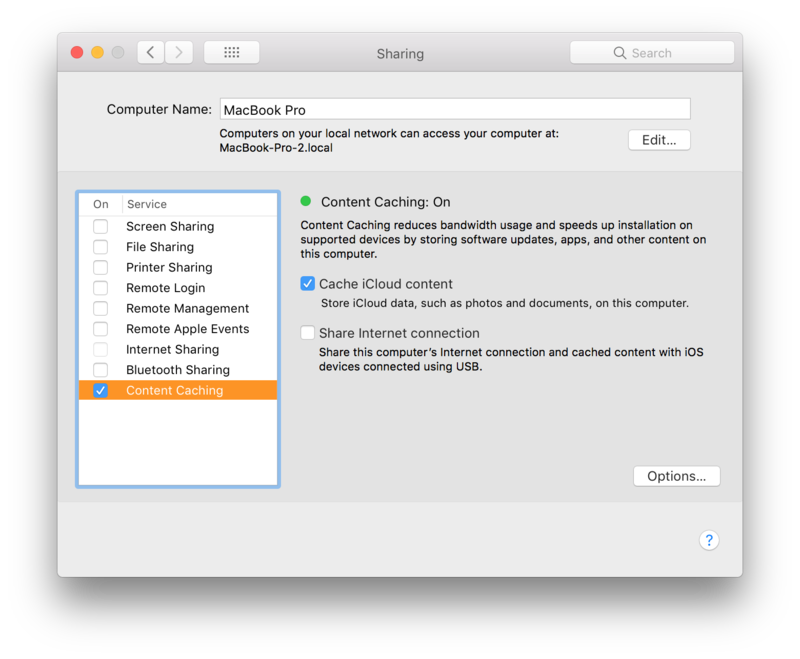 Just open System Preferences, click the Sharing icon, and then put a check in Content Caching. Mac updates will be cached too. Here’s a nice techie overview of this new feature. 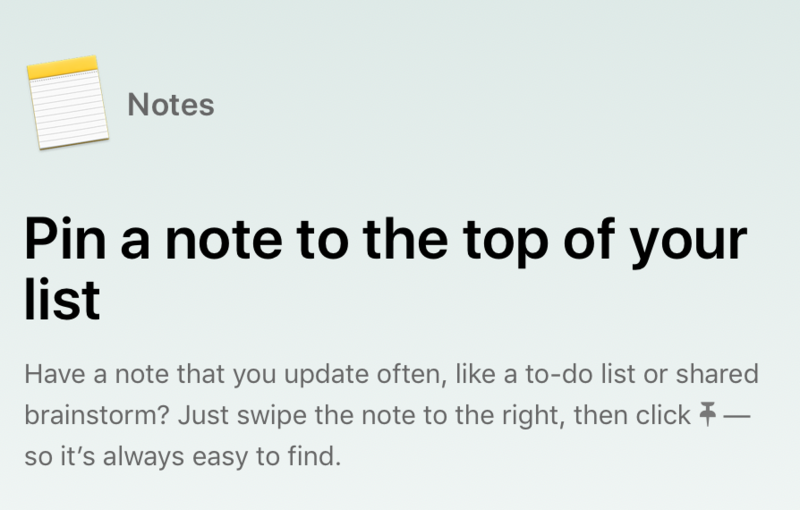 Important notes within the Notes app can now be pinned to the top of the list, so you don’t miss them. Just swipe right on them, or right-click and select Pin Note. Or click File > Pin Note. This one was actually flagged by Apple in its intro to High Sierra that pops-up a day or so after you upgrade, but I’ll bet you didn’t bother to look at that, did you!? 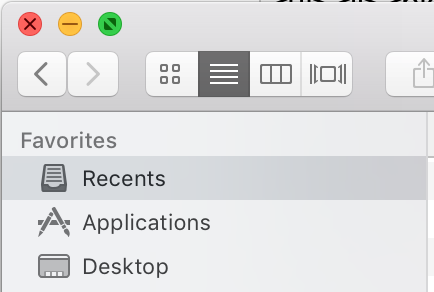 Easily one of the most dubious feature additions of recent years, All My Files in Finder’s sidebar was supposed to present you a quick at-a-glance view of things you’ve worked on. Instead, it was just a mess of files. In High Sierra, it’s switched out and now Recents takes its place, so that you now see – well – a list of the files you’ve recently accessed. It’s arguably still not very useful because it lists pretty much everything you’ve opened recently, and it would be more useful if it could reflect files you’ve actually edited or altered. Ah well. Maybe next time, Apple? Until now the media keys on the keyboard, as well as the earpods’ in-line remote, have only controlled iTunes (and the system volume). In High Sierra, the keys control playback of HTML5 video players, such as YouTube. This works in a slightly odd although ultimately sensible way, in that it controls the last thing you started playing. 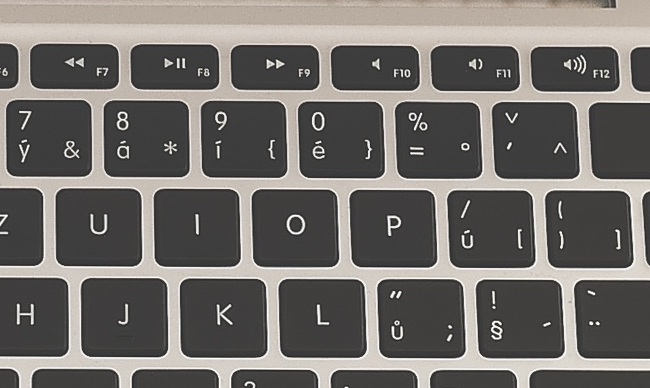 For example, if you start a YouTube video playing and then start a song playing in iTunes, the media keys will control iTunes – just as they always did. But should you pause and then resume playback of the YouTube video, using the on-screen controls, the media keys will now control that YouTube video – because that was the last thing you started playing. See also George Gardside’s terrific summary of hidden macOS High Sierra features. iPhone Hacks also wrote an interesting summary but there’s a lot of obvious stuff in there and a lot of filler (does anybody outside of India care that there’s now a Hindi San Francisco variant?!). Hey! Are you a YouTuber looking to put all this into a cool video? Rather than stealing it, why not provide a quick link back to this page in the comments beneath the video? You’ll feel a lot less dirty for doing so, and maybe together we can create a fairer world…? It’s got to be worth a try. With graphic adapter switching, will it still switch to the GPS on battery power for more intense operations, ie. Photoshop?